I am facing a problem when i try to put a break point on functions in ntdll, when i double click c:\windows\system32\ntdll.dll in the modules windows I get warning saying "Module c:\windows\system32\ntdll.dll has no names". 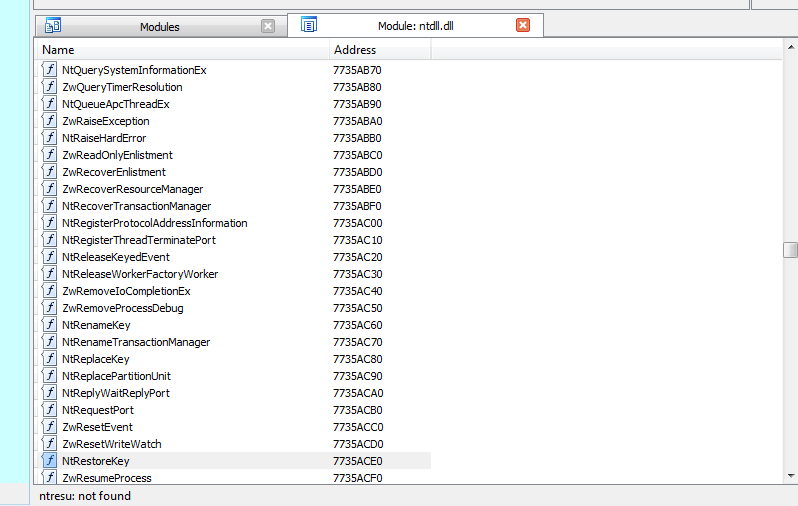 When i right click on c:\windows\system32\ntdll.dll in the modules window and select load debug symbols, it downloads something but I am still not able to see the functions i would like to put break point on like NtResumeThread. Appreciate any assistance or suggestions. Pic attached for reference. Simply set the breakpoint on ZwResumeThread (also shown in your screenshot). From user mode the only difference between NtResumeThread and ZwResumeThread is the name prefix. In kernel mode these functions (of ntoskrnl.exe instead of ntdll.dll) have implementation differences indeed. You may want to brush up on Windows internals a bit. This article by Geoff Chappell may help. Not the answer you're looking for? Browse other questions tagged ida malware . Ida Plugin Batch analysis issue.